I don't want to use any presets at all but instead want to program something from scratch. use the instant audio suite BC's in the Music Folder. There are options for creating your own using the Modify Settings version. Use the Tab key to change GUI selection. To program your own Batch Command, enter a sequence of key commands and/or mouse click and menu selection QuickLIst items to create a custom Batch Command. When finished, use the SAVE button and locate your saved Batch Command within the USER tab of the QuickList menu." It is unclear exactly how you go about 'recording' a sequence of mouse clicks and menu selections. Thanks but I might as well just set up a windows config. Surely I'm missing something. It should be 100% configurable. The mouse clicks are programmed already into quick list. So you just stack quick list to make the serious you want. So use "open telephone and modify". The Batch Command will open EQ3 and click the EQ. Then its up to you to enter in the numbers you want. and follow that with the Render Quicklist. As if now there is no "Record" option for making BC's by recording your actions. But if you have some request we can for sure figure out how to add them to the program.. So close to being incredible. My request is what I initially stated. But it seems pointless to have to come here and ask if I want to get something configured. 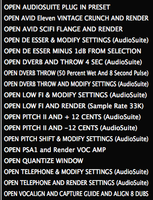 Do you want it pull up all of those audio suites at once??? I am not sure what you are try to do with the audio suites? ?